Whether you live in the U.K. and need inspiration for a mini break, or are visiting and looking to see a bit more of the countryside- heading to one of these places for a relaxing weekend is a must. With beautiful walks, quaint villages, classic English village pubs, history and some good ole’ fresh air, you’re sure to fall in love, whether it rains or not. On the Suffolk Heritage Coast, Southwold is a quintessentially British seaside town that oozes charm. With sandy beaches, an array of shops and markets, great restaurants and the famous Adnams brewery, there’s plenty of things to keep you busy. You’re not too far from other pretty Suffolk towns either, if you’re looking to venture out a little. The Cotswolds are known all over the world, almost fabled for the beauty of their cute English picturesque towns. Painswick is surrounded by lush rolling countryside and is perfect for pretty walks, gardens and of course, a pint. There are beautiful towns to explore nearby too, so the trip is absolutely worth it. Hawkshead was home to William Wordsworth and Beatrix Potter and loved by both. With its cobbled streets and whitewashed cottages it’s a beautiful, quintessentially British town with gorgeous inns, cozy teashops and heaps of old character. Cars are no longer allowed in the village, making it a walking paradise. But fear not- there are places to park very nearby. It’s the perfect place to endlessly wander and fall in love with its charm. This town has so much natural beauty, it attracts artists from all over the world, aiming to capture just a dose. Full of cafes, boutiques and arty shops, it’s a popular place to visit, especially in the hot summer months. Yes, you may even get a tan in England! There’s a mix of fisherman’s villages and narrow streets, relete wity natural light and scenic vistas. Cornwall is well worth a visit. 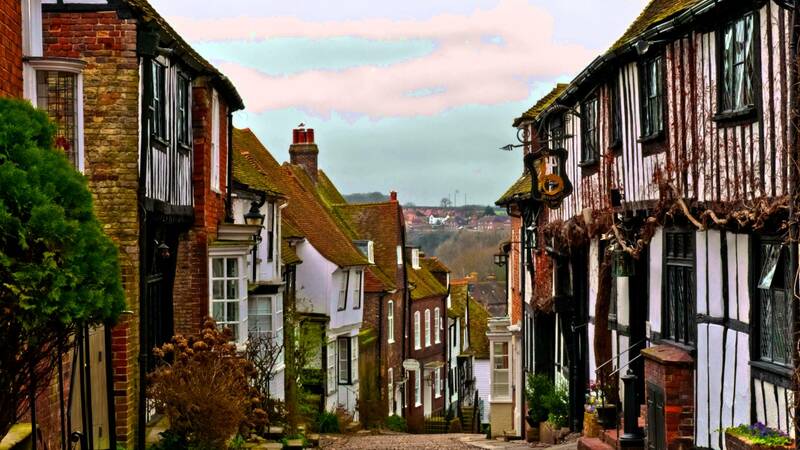 Just a couple of miles from the sea, Rye is a historic town with beautiful Tudor buildings. You’ll feel as if you’ve stepped into a better time. Perched on a hill, it’s cobbled lanes and charming streets make you feel like you’re suspended in vibrant history. Be sure to admire the architecture that surrounds you and check out the sweet, local shops- and their traditional British delicacies. The Yorkshire Dales are known for their stunning scenery, making thee perfect place for a beautiful aimless walk. Middleham is a small market town and home to the beautiful Middleham castle, once the childhood home to Richard III. If you’ve come in search of authenticity, history and natural delight, this is a spot not to miss on your countryside trip. Next ArticleUber Is Coming Out With A Credit Card. Can You Guess The Benefits? Any recommendations to try for a romantic winter escape over New Year for a few days? Try Exeter and the south west. So many beautiful places, lots of cafés and bars, long relaxed walks and shopping!